100 days. Cucurbita pepo. (F1) Semi-bush plant produces good yields of 2 lb squash that has shades of green, gold, and orange. It has flavorful golden flesh. 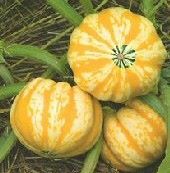 This gourmet squash is great baked or roasted. This bush type plant is suitable for small gardens. Excellent choice for home gardens and Farmer’s Markets. A summer squash variety.